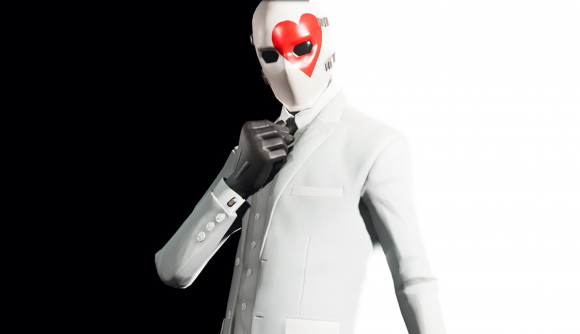 Fortnite developer Epic Games teased the cowing challenges for Week Nine today, giving us just a brief taste of what’s ahead next week with a tweet that reads: “Suit up… the High Stakes event begins next week and with it comes the new Getaway LTM, Wild Card outfit, and High Stakes Challenges!” Just what this new LTM is – or what those challenges are – wasn’t made clear, but we did get a look at the snazzy new outfit up for grabs (well, ‘snazzy’ in that psychopath killer kind of way). However, data miners may have already uncovered what those challenges are – at least for now. And with everything from assault rifle eliminations to treasure hunts all included, week nine looks set to be a bit tricky for Free Pass and Battle Pass players alike. Of course, these challenges can still be changed, but as always we’re sure they’re going to keep you battle royalers busy for another week and might even have some clues about what’s going on for Season Six. Here’s what we (think we) know. If the mining (by YouTubers Quadmft and The Goblin) is to be believed, Free Pass players will have to deal a certain amount of damage with explosives – a recurring challenge that most of you are probably experts at by now. Apparently there’ll be an easy challenge, asking Free Passers to simply use an ATK, and finally follow the treasure map through Haunted Hills. Both were quick to point out that this location could be changed. Battle Pass players – as usual – won’t have an easy time of it, apparently being asked to get seven chests in Pleasant Park, get five assault rifle eliminations, shoot 15 “jumping fish,” and three eliminations in Tomato Town. Of course, Tomato Town is now a temple, which means this challenge may very well have a different location or might not show up at all. You still have time to polish off any week eight challenges you might not have got around to yet, and lucky for you, we have a handy guide to help you get through them.